Stay or Go – What Should Cristiano Ronaldo Do? I debated how to phrase the headline – as a definitive statement on what he should do or as a question. While it looks like a question, it is actually a rhetorical statement. The answer is so obvious that it doesn’t make any sense for me to drag out a pros and cons before coming down on one side. RONALDO – DON’T LISTEN TO YOUR MAMA: STAY WITH MANCHESTER UNITED. She’s right about Real Madrid being a dream – it’s a bad dream otherwise called a nightmare. He looks way better in red, doesn’t he?! Why you should stay, you ask. Let me expound – in numbered, bulleted fashion no less. You are the king at United. This is your team, no matter the love for Rooney or Scholes or Giggs or Rio. Your team. At Real, Raul is king. And after him, it will be Casillas – and he’s only 27 and a goalie, so he will be around a long time. Oh, and he also just captained Spain to their first title in 44 years. You are the flavor of the election. Today, Calderon wants you to win his election. Once you are in the team, don’t you think the next guy contesting election is going to want his own galactico – maybe Bojan Krkic or the next freakishly talented Brazilian? At United, you will always be on a pedestal, much as Giggs and Scholes still are. Real is notoriously unstable because of the shenanigans that go on around the elections (Barca too). That’s why they keep changing coaches as well. Who is going to be your coach once Schuster doesn’t win the Champions League next season? You play on the best team in England and in Europe. It is a young team too. Other than Arsenal, there is no other young, world class team like it in the world. And Arsenal hasn’t won squat in four years. This team is the best team in the best league in the world. So, you are the player of the year in the best team in the world (and United will prove that by winning the World Club Cup later this year – BTW, you won’t play in that or the European Super Cup this year if you leave United) in the best league in the world – and a team that is poised to challenge (if not dominate) for a few years to come. And you want to trade that for a dream? Talk to Kobe for some pointers, son. Let’s talk about the platform a bit. First, the club. At United, Rooney and Tevez and the rest of the guys will do the tracking back that you don’t always have to do. You take the penalties and free kicks. No egos from guys like Rooney or Tevez or Rio or whoever. You really think that happens at Real? From players like Raul and Guti and Ruud and Robben? Forget what they say now. Wait till you are there. Ruud is going to take penalty kicks (especially after your recent two high profile misses, it is not a foregone conclusion that you get to push him aside for those) and Wesley Sneijder is going to take a fair number of free kicks. Then, the same thing will happen to you that happened to Torres. Defenders will not let you beat them with your pace as they won’t play up as much, won’t give you as much space and the midfield will be more compact as well so it is going to be harder for you to do your usual damage. The leagues are just different. The slower pace of La Liga is going to be to your disadvantage. Also, at United, you interchange with total freedom. Rooney, Tevez and whoever is playing attacking mid or opposite wing (Giggs or Nani) move around freely and let you move around freely. You come inside, switch wings, go crossfield, drop back, whatever. 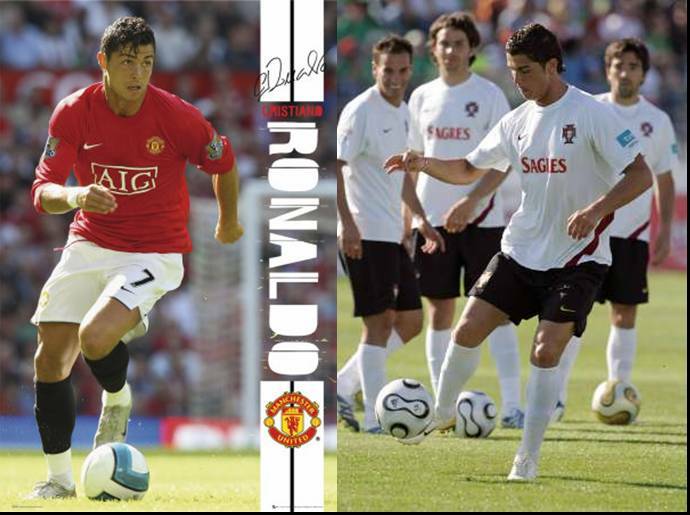 At Real, you will play like you do at Portugal. Except Real have players with even more ego and reputation. You will play more on the wing and have to serve balls to Ruud and Raul. Your goals will drop and so will your reputation. Trust me – we got a precursor at Euro 2008. The fans love you at United. Yes, they will love you at Real as long as you are doing well. Can you imagine white hankies waving at United? United fans embraced you after World Cup 2006 even though you were mischievous in your contribution to getting Rooney and England booted. The country even forgave you – somehow I don’t see that happening with a Portugese man in Spain. The blame will be on you if Real don’t win the Champions League within the next two years. Messi plays in La Liga. You don’t want to play in the same league as him since he will now be the showpiece at Barca and will come out of it as the player of the year in La Liga. Stop with the “I am a competitor; that’s a challenge I would relish” line. I am not saying he is better than you – just that he will come off better given his team situation relative to yours. Quieroz is at United and will probably be the next coach of United. Spain has just won Euro 2008. Casillas, Xavi, Cesc and Torres are going to be ahead of you in Spanish minds for a while – and God help you if they win the World Cup too. It’s more likely they win than England. You signed a contract. You are just one year in. I bet you United gives you more money, but at the level you are, does some more money mean more than winning and being the best? Karma is a mother. Loyalty seems to be an ugly word and yes, United and Fergie have thrown players out (see Becks and Ruud) after they were loyal to him and the club. However, this is ridiculous. The man protected you. The club and the fans embraced you. And you repay them like this? You are 23 years old. In two or three years you will enter your prime. Most United fans will not begrudge you your desire to move if you do so at that point. It would also be perfect reasoning as you can say it is contemporaneous with Fergie leaving. IF, that is, you decide it makes sense to move then. It makes no sense to do so now. Can you imagine how much of a bigger deal you would get if you solidified your United fan base and then moved after you had won a couple of World Player of the Year awards. It would be a much bigger move than doing so now. You will be joining a league where the rest of the teams have no real stars. Even Barca would have lost Ronaldinho, Deco, Eto’o and Gio Dos Santos. Contrast that with all the good players coming to the Premier League at Spurs, Everton, Portsmouth, Liverpool and Arsenal. The weather is better. Your girlfriend is Spanish. Playing for Los Blancos is a bit mythical. Fergie’s going to quit soon. It’s not going to be easy to top, let alone match, this season – on a personal and team level. The competition in England for the Premier League is going to be even more fierce. You will probably make more money from the image rights deal in Spain. You probably speak Spanish better than English. It’s your dream. Your mama wants you to go there.